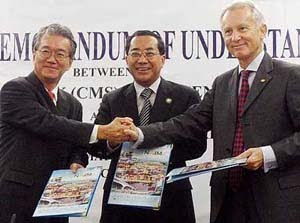 From left: Datuk William Wei, Datuk Mohidin Ishak and CMS group managing director Datuk Richard Curtis exchanging documents at the MoU signing ceremony on Monday. KUCHING: Naim Holdings Bhd, Cahya Mata Sarawak Bhd (CMS) and Bintulu Development Authority (BDA) have formed a joint venture (JV) to develop the proposed Samalaju new township, which is estimated to cost at least RM1.5bil. Located within Sarawak Corridor of Renewable Energy, the project will comprise residential developments, schools, clinics, commercial centres and recreational facilities for about 50,000 people. Naim has a 60% stake in the JV while CMS and BDA hold 30% and 10% respectively. 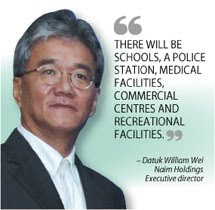 BDA is the state agency tasked with the planning and development of Bintulu. Naim executive director Datuk William Wei said the proposed new township, which would span more than 2,200ha, would be located about 15km north of the proposed Samalaju Industrial Park where energy-intensive industries would be sited. He said at least 5,000 units of houses would be built in the new township. “The JV (vehicle) will also develop and operate world class facilities for executives employed by the various industries,” he told reporters after the signing of a memorandum of understanding for the JV yesterday. The houses and facilities are expected to be completed by the first quarter of next year. BDA general manager Datuk Mohidin Ishak said construction work for the proposed plants for some of the energy-intensive industries in Samalaju Industrial Park would start next year. Sarawak Aluminium Company Sdn Bhd' aluminium smelter and Japan's Tokuyama Corp polycrystalline silicon plant will be located at Samalaju Industrial Park. Hong Kong-based Asia Minerals Ltd has also proposed to build a manganese smelting factory at the industrial park. Naim Holdings and Cahya Mata Sarawak will develop a township in Samalaju, Sarawak, to cater for an estimated 50,000 workers and their families. Naim Holdings Bhd plans to partner Cahya Mata Sarawak Bhd (CMS) and a local government agency to build a RM1.5 billion township in Samalaju, Sarawak, which will cater for the expected boom in the working population. The Samalaju Industrial Park is located 80km north of Bintulu and the proposed township will be home to those who will work at a giant aluminium smelter and other high-technology industries. The new township, covering an area in excess of 2,200ha a few kilometres from the Samalaju Industrial Park, will cater for the estimated 50,000 workers and their families. Construction will start next year and the township will be developed over 10 years. "The township is really required there. It won't work to have the workers commute between Bintulu and Samalaju," Bintulu Development Authority (BDA) general manager Datuk Mohidin Ishak said in Kuching. The state government has approved the town's master plan, he said. Yesterday, BDA signed a memorandum of understanding with Naim and CMS to form a joint-venture company. Naim will hold 60 per cent of the tie-up, with CMS having 30 per cent and BDA the balance. Naim was represented by executive director Datuk William Wei, and CMS by group managing director Datuk Richard Curtis. Mohidin said that their first priority would be the construction of "world-class standard" temporary camps for the 3,000 to 5,000 workers involved in building the town and those whose companies would be relocating to the industrial park. Construction of the camps just a kilometre from the park will start very soon and is scheduled for completion by the first quarter of next year, Wei said. The camps will be converted into storage facilities when the construction frenzy is over. Construction of the township will only start next year. Wei said that it would have all the amenities of a modern township. "There will be schools, a police station, medical facilities, commercial centres and recreational facilities." The Samalaju Industrial Park is an integral part of the state's industrial development corridor, the Sarawak Corridor of Renewable Energy. At least two smelting plants, including the proposed Sarawak Aluminium Co - a joint venture between mining giant Rio Tinto and CMS - will be sited in the area. There will also be a plant from Japan's Tokuyama Corp that will make solar panels and a new deepwater port. SUNWAY Holdings Bhd has signed a memorandum of understanding (MOU) with China’s Xuan Cheng Municipal Government to develop a two million sq m land into an integrated city in Xuan Cheng, 260km east of Shanghai. The project will feature an international-standard entertainment park, an exhibition centre, hotels, shopping malls, offices and residential units on land owned by the Xuan Cheng Municipal Government. Under the MOU, Sunway will be the master developer and will undertake a feasibility and market study on the proposed development. Sunway Holdings Bhd, a Malaysian builder and property group, rose to its highest level in almost one week in Kuala Lumpur trading after signing a preliminary agreement for a China development. The stock rose 2 per cent to RM1.52 at 9.20 am local time, set for its highest close since May 4. PETALING JAYA: Property developer Plenitude Bhd told Bursa Malaysia that it had entered into a sale and purchase agreement with Geotrade Sdn Bhd to acquire 27 parcels of freehold land in Batu Feringghi totalling 40.8 acres for RM45mil. Plenitude said in an announcement to Bursa Malaysia that the acquisition would enable the company to tap on an existing project in the location.